LASIK defense experts will attempt to talk over plantiff attorneys' heads. They'll say things like "the patient's problem is not his pupil size... the problem is spherical aberrations". The defense is counting on the fact that a plantiff attorney does not have a thorough understanding of higher order aberrations. Well, I'm going to attempt to explain higher order aberrations, particularly spherical aberration, so you can see how this is all pupil-size related/dependent. The diagrams above should help you understand the concepts. Keep in mind that vision is never as precise in a human eye as depicted in the diagrams. All eyes have some aberrations. It has been said that about 10% of the unfocused light in a normal, unoperated eye is due to higher order aberrations. This usually causes no problems for the patient. In eyes after corneal refractive surgery, the aberrations may be render the patient's vision horribly distorted and the patient may no longer be able to function normally in dim light. The first concept to understand is that "irregular astigmatism" is generally interchangeable with "higher order aberrations". Corneal astigmatism is measured, obviously, on the front surface of the eye, the cornea. Regular astigmatism is correctable with glasses or soft toric contact lenses. Irregular astigmatism cannot be corrected with glasses or soft toric contact lenses. Aberrations can be described as unfocused light rays striking the retina at the back of the eye (what the patient actually sees). Keep this in mind -- astigmatism/front/cornea, aberrations/back/retina. The terms "wavefront", "visual aberrations", and "aberrometry" are really not so hard to understand as long as a lying defense expert is not doing the explaining. Lying defense experts don't want you to understand because once you fully understand, the light bulb turns on in your head and suddenly you understand how all of this is pupil size related. And that's when you can control the lying expert. When a LASIK surgeon takes the measurement of a patient's visual aberrations, he/she uses a wavefront aberrometer which maps how the eye sees. The deviation from a perfectly focused image is expressed mathematically in root mean square error (RMS). Total RMS is a summary of all optical errors of the eye. Lower order RMS measures just the simple shapes of defocus which are correctable with glasses or soft toric contact lenses (myopia, hyperopia, astigmatism). Higher order RMS measures the complex shapes of defocus (irregular astigmatism) which cannot be corrected with glasses or soft toric contact lenses. The two most common forms of higher order aberrations are coma and spherical aberrations. Aberrations get their name from the shape of the distorted image. Imagine a star in the sky at night. If the patient has an off-centered LASIK treatment, the star will have the appearance of a comet with a tail. In other words the light will be smeared in one direction. The name for this visual aberration is coma. Many patients have spherical aberrations after LASIK (all of them would if their pupils dilated beyond the LASIK treatment). Just like coma gets its name from its shape, spherical aberrations gets its name from the fact that the unfocused light has the shape of a ball. The headlight from a car streaks out from the source in all directions. The fourth image above shows how spherical aberrations happen. Most LASIK patients have both, coma and spherical aberration. But to what degree? How "bad" is it? That's where the RMS values are important. When you're looking at a patient's medical records and you get to the post-op wavefront scan, look for the RMS value of higher order aberrations. 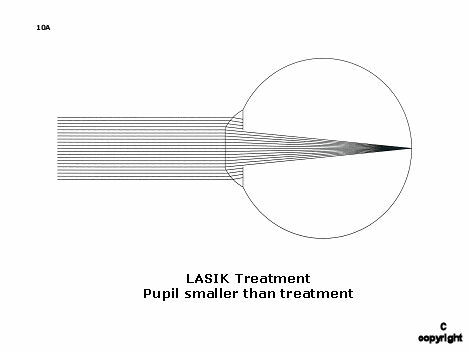 The LASIK industry rule-of-thumb is that anything less than .3 microns (all higher order aberrations combined) should not cause the patient too much of a problem. Maybe their "brain will adapt" and they'll get used to it and quit complaining. If the aberrations are severe, the patient's quality of life is likely compromised. Now, please pay attention because this next concept is key. AT WHAT DIAMETER WAS THE SCAN TAKEN? If you want to know what the patient sees at night, the scan diameter must be as large as the patient's naturally dilated pupil size in the dark. 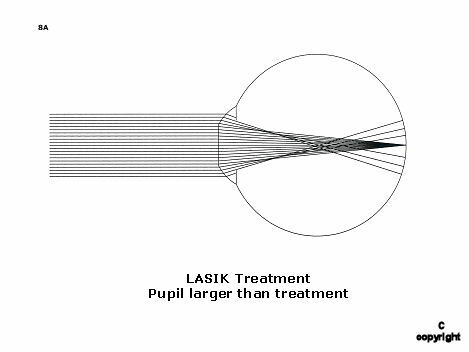 DO NOT FALL FOR A LASIK SURGEON'S TRICK OF THE TRADE -- MEASURING THE ABERRATIONS SMALLER THAN THE PATIENT'S PUPIL SIZE. Taking a wavefront scan smaller than the patient's pupil is like weighing a 250 lb. woman on a scale that only goes up to 150 lbs. It's meaningless to night vision. The aberrations are induced on the corneal surface when the laser changes the shape of the cornea. 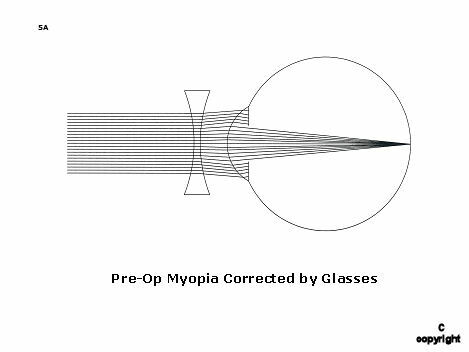 Let's consider a simple example of a patient with pre-op myopia. The laser flattens an area of the cornea to change the focus of the eye (see the diagrams above). It sounds great in theory, but it creates a huge problem for patients with large pupils. The reason it creates a huge problem for patients with large pupils is very simple. Most lasers only correct a 6 mm or 6.5 mm area in the center of the cornea (known as the "optical zone"). Some patients have pupils as large as 8 mm at night. OK, common sense is going to tell you that if the image was unfocused before LASIK, it's going to be unfocused after LASIK if you didn't fully correct it. After LASIK a patient with 8 mm pupils will have a "multi-focal" cornea. This is a huge problem, and one that glasses and soft toric contact lenses cannot correct. The greater the mismatch, the more severe the problem. Now I'm going to throw you a curve ball. 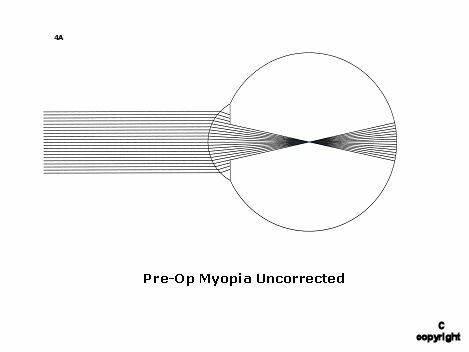 The greater the degree of pre-op myopia, the more likely the patient will experience night vision disturbances. And the reason for this is, again, related to pupil size. You need to understand the concept of "effective optical zone". 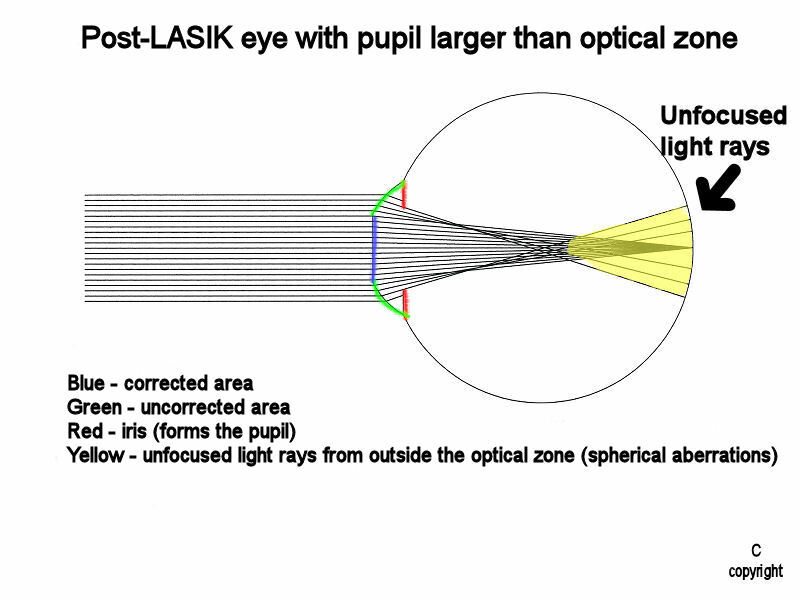 Just because a LASIK surgeon used a 6 mm optical zone doesn't mean that 6 mm was fully corrected. Believe it or not, the geniuses that designed lasers for refractive surgery did not take into account that the cornea is not flat! Lasers were designed to treat flat surfaces. What happens is that the laser loses efficiency on the slope of the cornea. The very center/top of the cornea receives the full effect of the laser but the periphery doesn't. The end result is an effective optical zone smaller than intended. Whenever the patient's pupils are larger than, say, 4.5 or 5 mm, light will pass through the periphery of the treatment zone that wasn't fully corrected. You can actually see and measure this on the topography. The yellow ring is the border of the effective optical zone. The first thing that the industry did in response to these problems (and associated problems) is that they added a "blend zone". The blend zone was designed to prevent a sharp transition between the treated area of the cornea and the untreated area of the cornea. It does not receive the refractive correction. Light that passes through the blend zone will be unfocused. If a LASIK surgeon says his laser has an 8 mm ablation zone, he's counting the blend zone. The blend zone doesn't count! The second thing the industry did (because the first thing wasn't good enough) was to release a new, improved form of LASIK called "custom LASIK" or "Wavefront LASIK". Sure, they "attempt" to measure and "attempt" to treat that ~10% of defocus that glasses can't correct. And they also added more laser energy to the periphery of the treatment to compensate for the loss of efficiency on the slope of the cornea. But this still doesn't cut it when the patient has a large pupil. And oh by the way, wavefront custom LASIK actually increases the higher order aberrations -- it doesn't reduce them in normal eyes. Unfortunately for patients with large pupils, most aberrometers can only measure up to a 6 or 6.5 mm scan diameter. There are some aberrometers that can take a larger scan. If you find one that can measure larger, you'll need to also find a surgeon who is willing to take the scan larger. Good luck! Although not a Lasik patient, I try to read the forums every day or 2 to see "what is new". I am amazed at how a procedure like this was ever approved by the FDA. If this doesn't change the minds of anyone thinking about having this done, what will? Also, the pictures are a very informative guide, rather than just words that some people don't read. Pictures tell the story, that is why newspapers have them on the front page. Kudos for an excellent post. I intended to make this easy for the average layperson to understand. I appreciate any input or questions. Surgeons must exercise care when treating eyes with larger scotopic pupils, especially if the procedure is expected to induce higher levels of spherical aberration (patients with large pupils will experience more symptoms with higher levels of spherical aberration). Spherical aberration is an optical complication of laser vision correction that results in the visual symptoms of glare, starburst, and halos. They can be minimized by proper patient selection (avoiding patients who have large pupils and require high myopic corrections). Further clarification. The yellow area on the 2nd image is spherical aberrations. Scott MacRae, MD, Professor of Opthalmology and Visual Sciences from the Department of Ophthalmology, University of Rochester Medical Center, Rochester, NY, adds, ?It is critical to know the pupil size in the evaluation of higher-order aberrations. The larger the pupil size, the greater the amount of higher-order aberrations.? In 1996, Klonos and Pallikaris used a computer model to predict image quality after photorefractive keratectomy.7 In this article they make a statement similar to the conclusion by Roberts, which seems logical to us: ?When the ablation zone covers the entire entrance pupil, the image quality may be uniform. However, if the entrance pupil is not fully covered by the ablation zone, disturbances in night vision often are reported as starbursts and halos around bright sources of light.? In discussing their ?Excimeye? ray tracing modeling program they state: ?For example, lateral spherical aberration is the radius of the retinal blur circle relative to pupil diameter and, therefore, the wider the pupil size is, the bigger the blur circle is, resulting in a bad retinal image.? Recently, a St. Louis County jury awarded a LASIK patient more than $3 million in damages on the grounds that the surgeon failed to measure his pupil size properly and failed to warn him of the possible negative consequences of his larger-than-average pupils. The patient claimed that he sustained ?significant and permanent disturbances in his vision, particularly at night.? ?Everybody agrees that we should measure pupil size,? notes Dr. Salz. ?There are many ways to do this; I like the NeurOptics Pupillometer, which is fast and objective. But whatever technique you use, make sure you measure the pupil in the dark. Illuminat?ing the eye constricts the pupil and produces an accurate measurement.? Dr. Salz notes that numerous studies have shown that higher-order ab?errations increase with pupil size. ?For example,? he says, ?consider the wavefront analysis of one of my preop pa?tients, who had the largest scotopic pu?pils I?ve encountered to date?at times over 9 mm. When her left pupil diameter was 8 mm, her spherical ab?er?ration was .21 and her coma was .52. When she was dilated to 9.7 mm?close to her natural scotopic pupil size ?her spherical aberration more than doubled to .43, and coma reached 1.36. ?You also have to consider that even custom LASIK will probably make these numbers worse,? he adds. ?With this patient we did extensive informed consent, showing her the relationship between pupil size and higher-order ab?errations, and explaining that the surgery might make the aberrations worse. Because she was highly motivated, she chose to proceed with the first eye. Postop, with the pupil at 8.6, her spherical aberration rose to 2.2 ? 10 times her preop 8-mm number. ?The bottom line is if you tell a patient he?s not at risk because of his pupil size, regardless of your justification, he may later go to someone else,? he says. ?If that doctor makes his pupil smaller and his symptoms go away, how can you argue that the pupil was not important? In addition, the pa?tient brochures for custom surgery from Visx and Alcon both warn that patients are at risk of vision problems if they have larger-than-normal pupils. Even the FDA website contains a similar warning. So not telling the pa?tient that he?s at risk unquestionably puts you at risk.? Dan Tran, MD, medical director for Coastal Vision Laser Eye Center in Newport Beach, Calif., agrees. ?Pupil size does matter, for two reasons,? he says. ?First, if the pupil is large and the treatment area is large, you?re not going to end up with a prolate cornea. There?s no way you can maintain a prolate shape under those conditions, even with wavefront. That means you?re going to increase spherical ab?erration. And the greater the correction, the more significant the problem. ?Second,? he continues, ?the treatment must be perfectly centered, taking into account not only the pupil, but also the visual axis. A slight decentration will cause problems if the pupil is large, and the larger the pupil size, the more likely it is that you?ll get into trouble.?
? Do one eye and see how the pa?tient reacts. ?I do one eye at a time in everybody,? says Dr. Salz, ?but particularly in a large pupil patient. That way I don?t do the second eye until I?m sure that they?re satisfied with their night vision.?
? Pretest with Alphagan. If a patient has large pupils, Dr. Salz suggests making sure that eye drops will be an option for countering dilation at night. ?Let the patient know that he might need to use the drops for the rest of his life to minimize night vision problems,? he says.
? For large pupils, do preop wavefront analysis. If the pupil is bigger than 6.5 mm, do a wavefront study and see how high the preop wavefronts scores are. If a patient has a relatively low level of aberrations, he?ll probably be fine.
? If possible, perform custom LASIK. ?Conventional surgery tends to double preop higher-order aberrations,? observes Dr. Salz. ?If the pa?tient starts with .5 RMS and you do conventional LASIK, you may double that to 1.0, and the pa?tient will probably have a lot of trouble. ?In contrast,? he continues, ?custom surgery doesn?t generally increase these aberrations as much as conventional LASIK.? Dr. Salz says this has been borne out by his clinical experience. ?Since we?ve begun performing wavefront-based treatments, I haven?t had a single patient?even the patient with the 9-mm pupil?choose not to have the second eye done. That wasn?t true when I was doing conventional surgery. Some of those patients have never done their second eye because they were so freaked out by the quality of their night vision.? J Cataract Refract Surg. 2005 Jul;31(7):1306-13. Systematic evaluation of wavefront-guided outcomes. Kezirian GM, Drum B, Eydelman M.
The pupil size used in the calculations also affects the result because larger pupils allow more peripheral information. So what does all this mean to a patient with large pupils? "Before wavefront-driven custom ablation, outcomes of plano and 20/20 were the industry standard, and ?there was nothing we could do or measure if our patients weren?t happy with that,? said Dr. Krueger, medical director of refractive surgery at the Cleveland Clinic?s Cole Eye Institute. ?However, we now can identify any higher-order aberrations that a LASIK procedure may have induced. Now the question becomes whether we can treat these aberrations.? Traditional LASIK may be most responsible for induced aberrations. According to Dr. Krueger, ?spherical aberration can increase by more than 100 percent ?and coma and other aberrations by more than 50 percent?after conventional techniques.? In a study by Mrochen et al., researchers looked at the clinical and theoretical effects of subclinical decentrations on the optical performance of the eye after PRK. They found that PRK-induced aberrations were significantly greater than preoperative aberrations, with subclinical decentration (< 1 millimeter) a major factor in increased coma- and spherical-like aberrations after laser surgery. To minimize these higher-order optical errors, the authors recommend eye-tracking systems that consider the visual axis.? The result? Diminished visual quality and contrast sensitivity." Last edited by kaleyedoscope on Tue Jan 29, 2008 1:10 am, edited 1 time in total. Thanks for this link, kaleyedoscope. 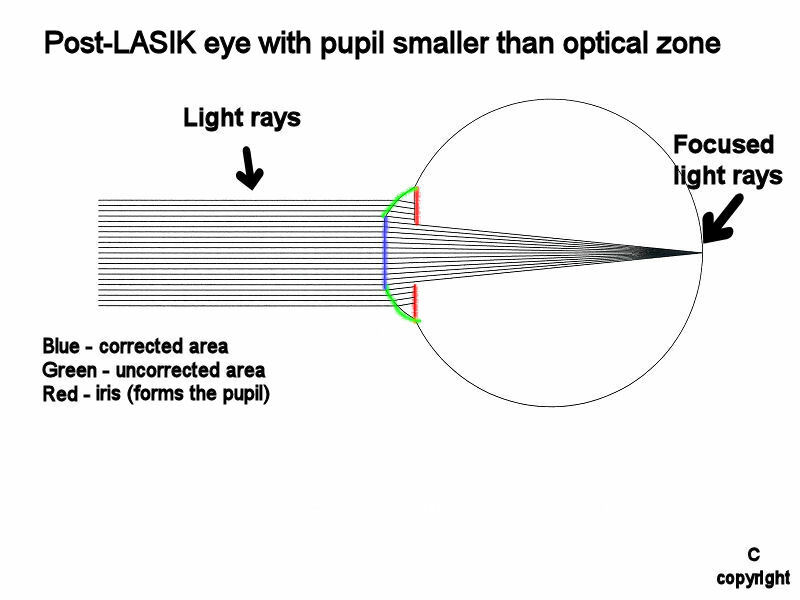 Spherical aberration is a fourth-order aberration that varies with the radial distance from the center of the pupil. Therefore, an optical system may have no refractive error in the center of the pupil and an increasing error in the annular zones that surround the pupil?s center. The resultant image may appear sharp for small pupil diameters but degrade as the pupil expands. Figure 1 shows the effects of spherical aberration on paraxial and marginal rays. The former travel close to the optical axis and are minimally affected by the aberration. These rays, therefore, focus at the rear focal point F of the eye. Marginal rays pass through the pupil?s edge. In the presence of spherical aberration, they will not focus at F but at the marginal focus M. The level of longitudinal spherical aberration, measured in diopters, equals the difference in vergence between the marginal and paraxial rays. Spherical aberrations can be positive or negative. Normal preoperative eyes usually contain low amounts of positive spherical aberration, which has a central accelerated area (focus of hyperopia) surrounded by a retarded ring of light (annulus of myopia). With normalization in the far periphery, the three-dimensional wavefront profile resembles a flat sombrero (Figure 2). A small percentage of the normal patient population can have negative spherical aberration with an inversion in the shape pattern. Negative spherical aberration has a central retarded area (focus of myopia) surrounded by an accelerated ring of light (annulus of hyperopia). We describe this pattern as a flipped-over sombrero hat or a doughnut-shaped profile (Figure 3). Patients who undergo myopic treatments develop an oblate corneal pattern.7 The wavefront pattern shows a flattening or concavity to the otherwise bowl-shaped wavefront of myopia. Analyzing the wavefront of these myopic treatments reveals that the spherical aberration increases in numerical value and size on the 3-D wavefront profile. For a hyperopic ablation, the surgeon removes tissue from the peripheral area, thereby flattening this region and producing an increased central corneal curvature as a final result. Patients who undergo hyperopic treatments have an accentuated prolate corneal pattern that results in a dampening or inversion of the otherwise hill-shaped hyperopic wavefront.8,9 When we analyze the spherical aberration pattern of these eyes, the magnitude of spherical aberration decreases, and the shape pattern becomes inverted (the flipped sombrero or doughnut shape). A big part of good results is acquiring a good wavefront image on which to base a custom procedure. Jonathan Davidorf, MD, of West Hills, Calif., says his technicians have developed some ways to ensure good wavefront captures. ?They know that the bigger the pupil, the more data they can collect,? he says. ?So we have patients sit in a dark room to let their pupils dark adapt. It only takes around five minutes. The other issue we run into with data acquisition is dealing with accommodation. To help resolve this, we have patients think of a relaxing place, maybe a beach or beside a lake, and this seems to enable some of them to minimize their accommodative response. In fact, I just operated on someone who, in his preop testing, accommodated 2 to 3 D more than what his manifest refraction was. When we repeated the wavefront on the day of the procedure and had him relax through visualization, he was able to match his manifest refraction.? Though Dr. Davidorf prefers to perform a custom procedure on anyone who?s a good candidate, he notes that it may not be necessary, and could be detrimental, in someone with very small pupils. ?This is because most of the aberrations, particularly spherical aberration, are occurring at a wider diameter. If you do a wavefront treatment on an eye with a physiologic small pupil in low light, but you?re basing your wavefront-guided treatment on a non-physiologic, dilated pupil, there could be some impact of that correction on the central zone. You?d hate to correct the unimportant higher-order aberrations that the patient never sees but potentially compromise the refractive outcome. ?